1942 All industries, materials and people working for the war effort. 2 1942 All industries, materials and people working for the war effort. 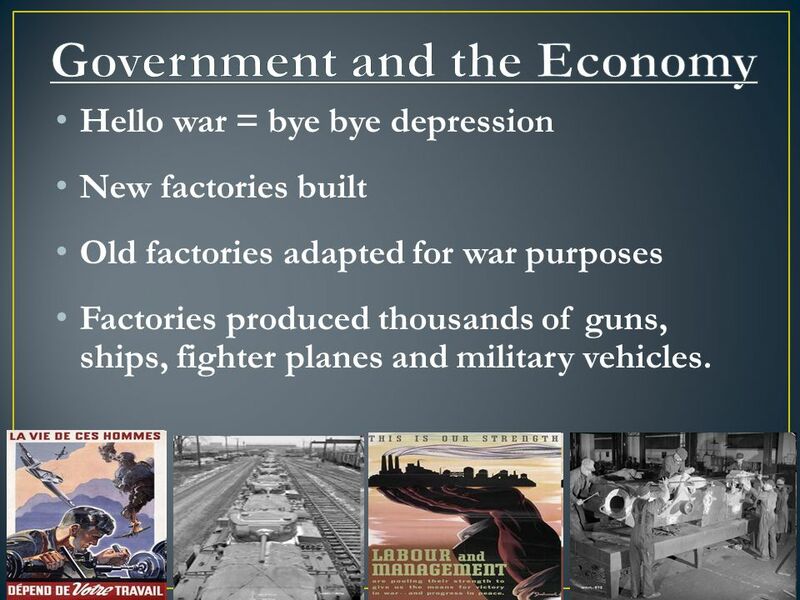 3 Hello war = bye bye depression New factories built Old factories adapted for war purposes Factories produced thousands of guns, ships, fighter planes and military vehicles. 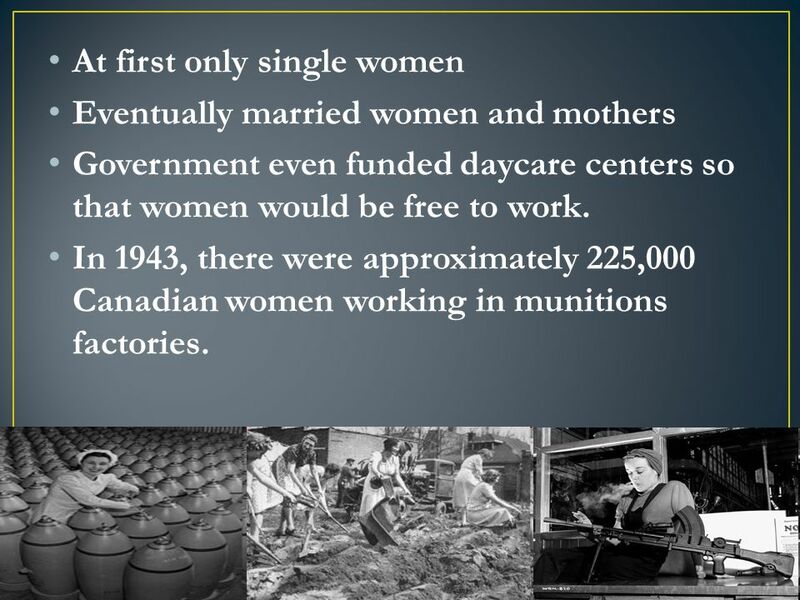 5 At first only single women Eventually married women and mothers Government even funded daycare centers so that women would be free to work. 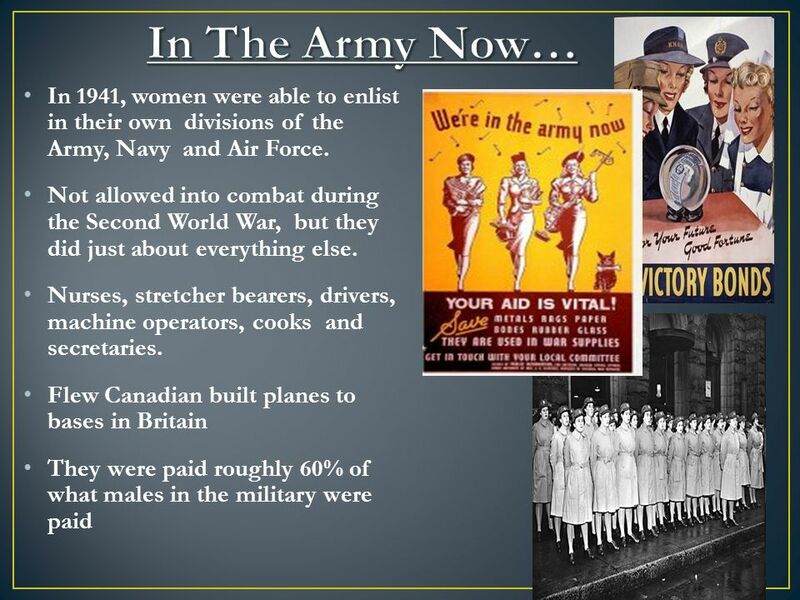 In 1943, there were approximately 225,000 Canadian women working in munitions factories. 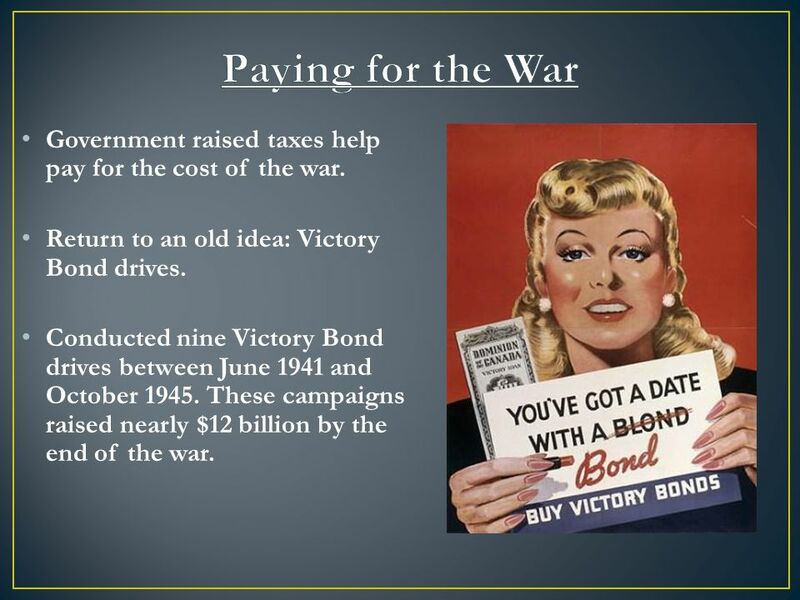 8 Government raised taxes help pay for the cost of the war. Return to an old idea: Victory Bond drives. Conducted nine Victory Bond drives between June 1941 and October 1945. These campaigns raised nearly $12 billion by the end of the war. 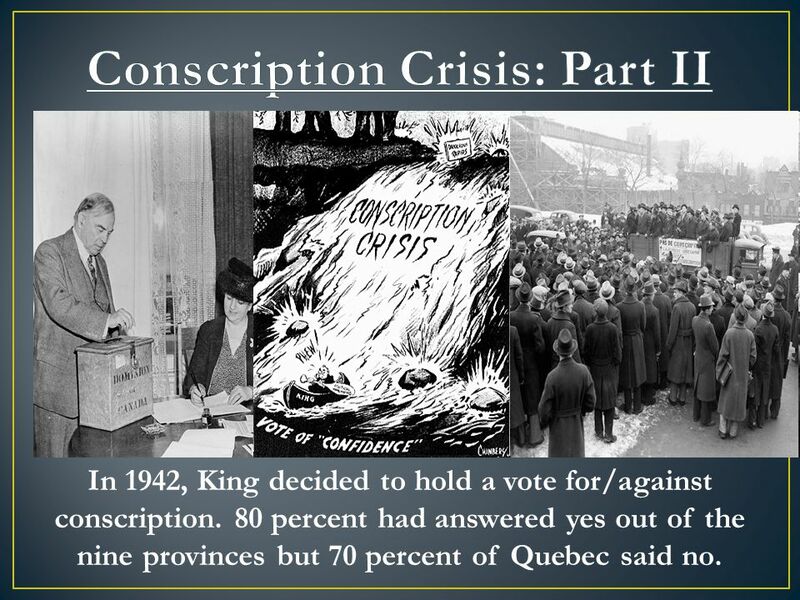 9 In 1942, King decided to hold a vote for/against conscription. 80 percent had answered yes out of the nine provinces but 70 percent of Quebec said no. 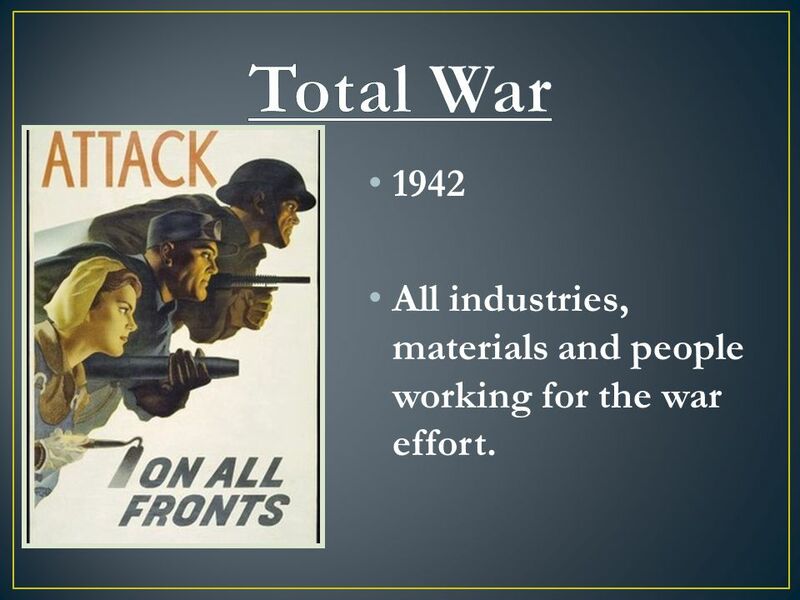 Download ppt "1942 All industries, materials and people working for the war effort." 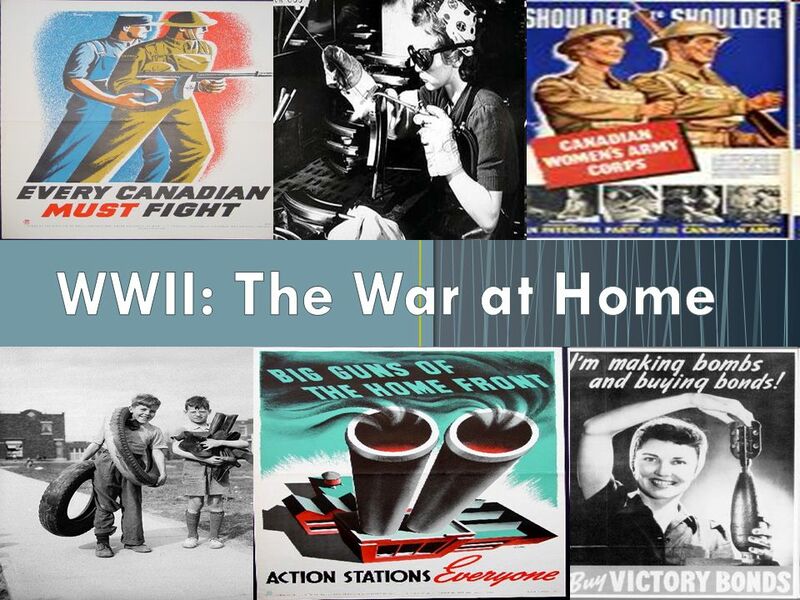 WOMEN AT WAR AND WAR ON THE HOME FRONT. Women at War Just as they had done during World War I, women played a vital and essential role both at home and. By 1942, Canada was committed to a policy of “Total War” which meant that all industries, materials and people were put to work for the war effort. WWII: The War at Home. Total War By 1942, Canada was committed to a policy of “Total War”. All industries, materials and people were put to work for the. The Home Front.  British Commonwealth Air Training Program  Announced on Dec 17, 1939  Air Crews and Pilots from all over the commonwealth were brought. What is the Home front? Two important factors / issues affecting the Home front. CONSCRIPTION & THE ROLE OF WOMEN. 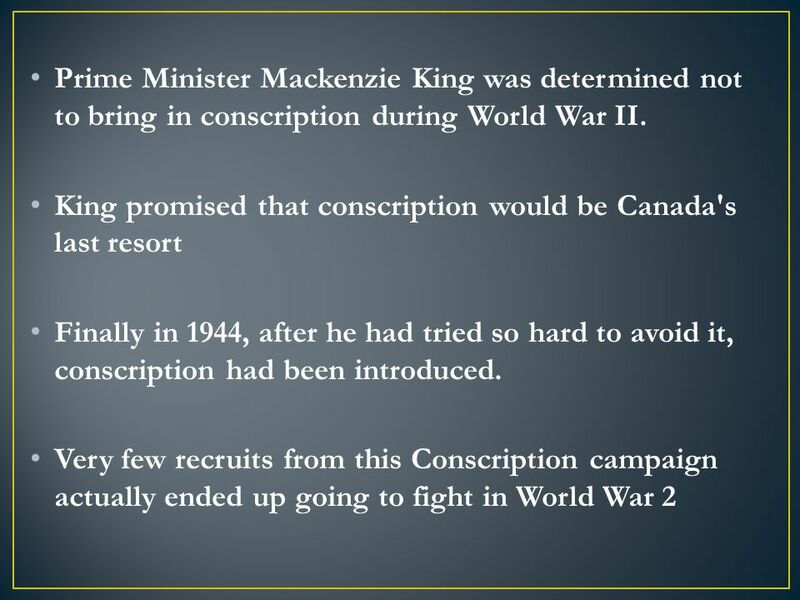 Conscription During World War I How Canada handled the problem of dwindling enlistments. FALL OF FRANCE AND THE CANADIAN HOME FRONT. Fall of France  Maginot Line – The most sophisticated trench in history.  Decoy on Belgian front (May 10. WWII: The War at Home. Total War A war fought w/ no limits put on the resources used to achieve victory By 1942, Canada was committed to a policy of “Total. SECTION 2.  SELECTIVE TRAINING AND SERVICE ACT  1 ST PEACETIME DRAFT IN US HISTORY  MEN BETWEEN AT FIRST, LATER ON  MADE IT MANDATORY.  Even though the war was fought in Europe, Canadians were afraid that Germany might attack Canada.  The Premier of BC even bought 2 submarines to protect. 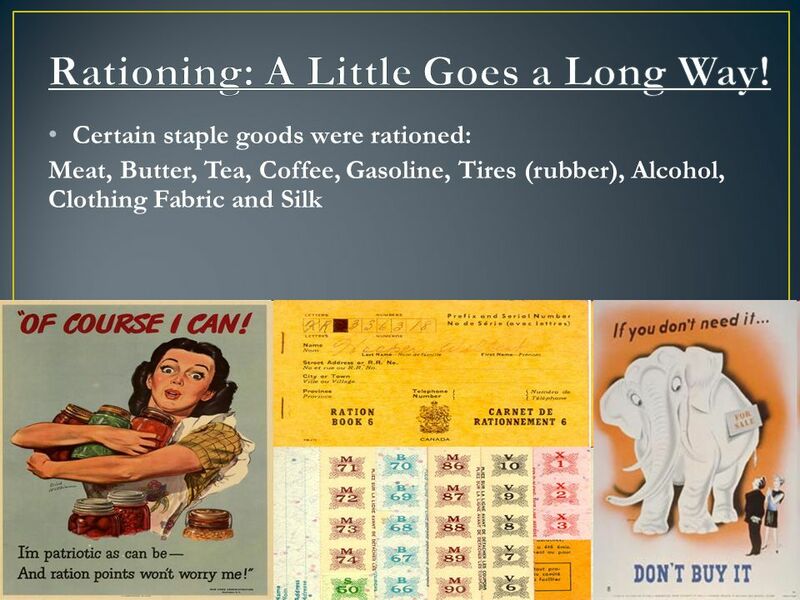 Topic #1 Review Propaganda & The War Effort. Government Control – Propaganda Government used posters, radio ads, newspaper articles to encourage people. On the Home Front Chapter 26 Section 3. 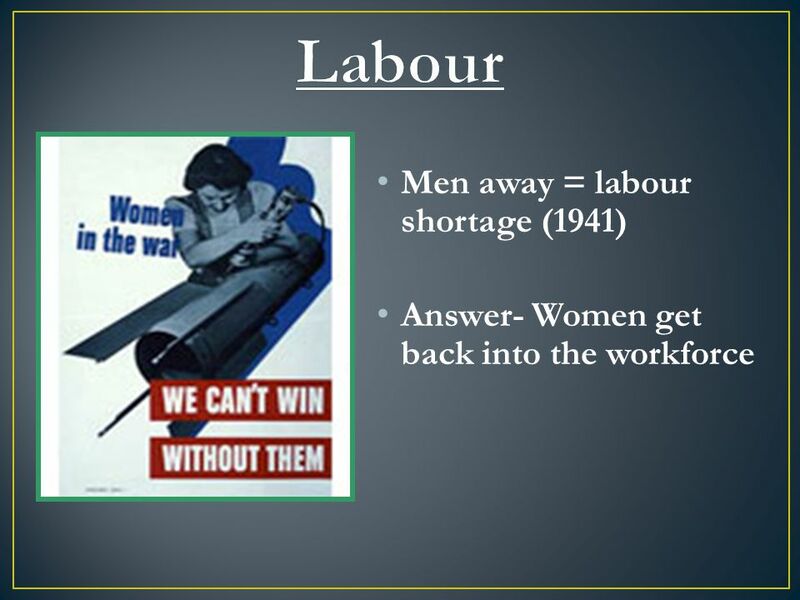 Women and Change: World War II SS5H6: The student will be able to explain the reason for America’s involvement in WWII. World War 2 Canadian History 11. Describe Canada’s contribution to the War in the Air. How did these contributions help the economy? RCAF was 40 combat.